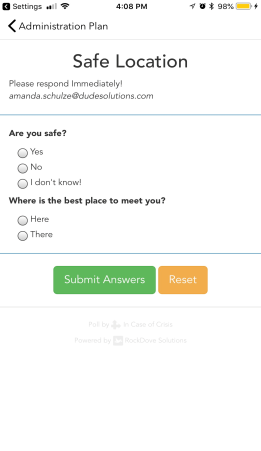 As a user of the Safety Center Mobile App, you will receive a notification on your mobile device informing you that a Poll has been sent out. This notification will include the Title of the Poll as well as the amount of time before the poll expires. *Note: If you have disabled notifications for Safety Center on your device, you will not receive this notification. Open the Safety Center Mobile App. A notification window will open asking you to answer the active Poll. Click OK.
You will be brought to the Poll where you can enter your answers to the Poll Questions. If you need to start over, you can click Reset to undo your selections. Click Submit Answers to finalize your selections. Once you have submitted your answers, you will receive confirmation of your submittal.